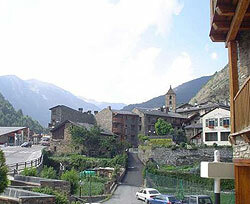 Ordino is Andorra’s largest and least populated parróquia. While the swell of international settlers in its capital, Ordino, has caused much development, the town’s centre with its main square and buildings built with local stone retains its quaint character. One of its main institutions is the Museu Casa d’Areny-Plandolit, once the house of a well-off family. It exhibits the family’s furniture and other household possessions, and gives a glimpse of how wealthy Andorrans lived in past centuries. The town of Ordino is quite accessible; it’s easy to travel to Andorra la Vella from here, with a daily bus that arrives and departs frequently. Despite its calmness and lack of big-town bustle, the parróquia of Ordino by no means lacks vitality. The Ordino Valley is lively all year round. With its surrounding rugged peaks, it is a great place to try a challenging hike in the summertime. If you’re a beginning or intermediate skier, you can try the Ordino-Arcalis slopes. Ordino also has many picturesque rivers and lakes high up in the mountains, and fishing is a popular activity here. The diamond-shaped Sorteny Valley Natural Park is a botanical paradise where visitors can go on guided hiking tours in the summer and skiing in the winter. A home in this town doesn’t come cheap, though. Like its neighbour, La Massana, this residential neighbourhood is very popular with foreign buyers. It’s no surprise that once they acquire their homes, few owners put them back on the market; this is what drives up the property prices of the few houses for sale here. La Cortinada is set in the middle of green meadows and tobacco fields. A typical Andorran village, La Cortinada is small, with stone houses and a lovely Romanesque church with colourful medieval frescoes on its walls. As a nod to modernity, there are some hotels here, and La Cortinada is popular with hikers and tourists.